Boston University reports that as many as one in three people with an autism diagnosis cannot communicate verbally. These men and women have a great deal to say, and they often want to participate in normal activities with their family members and friends. Consider the following safe, supporting and engaging activities for nonverbal autistic adults that your loved one can enjoy. A variety of educational enterprises engage and entertain adults with nonverbal autism. In addition to introducing your loved one to new ideas, these activities give adults the opportunity to learn more about topics that interest them. Adults with autism often focus on one particular interest, such as vehicles, computers or numbers. Equip and encourage your loved one to write a book or record a video based on his or her passion. If capable, let them choose the subject and type the script. Then, they can draw or use a computer program to create the illustrations or use figures and blocks to create images. Publish the book online or print copies so your loved one can go back and see what they’ve created. Even if your loved one can’t read a book aloud, they can explore books and magazines. Provide a selection of colorful magazines, field guides, encyclopedias, coffee table books, and graphic novels. As they look at the pictures and listen as you read the articles, it enables them to explore cultures, people, and animals from around the world. Several fun activities prompt adults with nonverbal autism to improve their social skills and expand their social interactions. You can encourage your loved one to engage in social activities one-on-one or in a small group. Using a template and blocks, two adults can work together to recreate a design. This activity takes advantage of visual and tactile strengths, allowing your loved one to use their facial expressions and gestures to communicate. Music unites and entertains people as it transcends abilities, interests, and age. Along with peers or family members, your loved one can use rhythm instruments and drumsticks or pots, pan, and spatulas to mimic the rhythm of a favorite song. You can also hum tunes, make music with water in various sized glasses or dance to music together. Introduce noncompetitive activities like swimming, biking or dancing to increase fun among peers. You can also change the rules to competitive games and sports as you build camaraderie and introduce your loved one to a broad range of playful experiences they can enjoy with others. For example, kick a soccer ball back and forth, reduce the rules for board games and work together to stack Jenga blocks instead of competing to pull out the blocks. Many nonverbal adults can communicate as they write, type, or use sign language, picture cards or digital communication devices. Introduce your loved one to exercises that expand his or her communication skills and ability to engage in the world. Art can give your loved one an outlet to communicate their thoughts, feelings, emotions, and perspectives. Provide supplies and encourage adults to draw, mold clay or knit as they exercise creativity. Through sign language, adults gain access to a portable and visually-based communication method that allows them to convey feelings, opinions, and thoughts. Sign language can also improve independence and confidence. Find a sign language class online, in the library or through another source, and watch it with your loved one. Use the signs you learn as you interact and communicate throughout the day. Having fun gives adults an outlet for their energy. Recreation also opens doors for relationship building, communication improvements and learning opportunities. Consider this partial list of engaging and fun recreational activities for nonverbal autistic adults. In addition to these suggested activities, you may have other ideas you wish to explore with your loved one. First, consider several tips that help you choose safe, supportive and engaging activities for nonverbal autistic adults. To maximize engagement, choose activities based on the person’s interests. Your loved one is more likely to participate and gain the maximum benefit from the activity when it revolves around a topic he or she enjoys. When you choose activities that match your loved one’s abilities, you create an atmosphere for success. Consider fine and gross motor skills, independence and other relevant factors as you match adults with abilities. Your loved one probably has an opinion about which activities he or she enjoys or wishes to participate in. Take time to listen, and you demonstrate respect as you introduce beneficial opportunities. 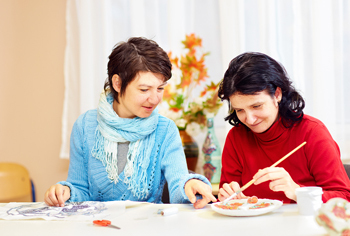 Sometimes, assistance can enhance your loved one’s ability to participate and enjoy activities. Provide mobility tools, communication devices or professional staff, if necessary, as you support your loved one. Activities should be fun, relaxed and enjoyable, so don’t pressure your loved one to play a certain way or participate if he or she doesn’t want to. Relax and focus on having fun. Adults with nonverbal autism can enjoy a variety of activities. Support your loved one with the safe, supportive and engaging activities on this list or choose others that your loved one will enjoy and appreciate. Learn about additional support services for nonverbal adults with Autism.